Discussion in 'Latest US & World News' started by Striped Horse, Feb 12, 2019. I've been closely following the Gilet's action every week; the best sources are, of course, French language and the Gilets themselves. It seems to me that the protests have lost none of their energy. Reports of the numbers turning out each Saturday clearly are downplayed by the government and probably overplayed by the Gilets - somewhere in between the two is probably more accurate. However, the Minister of the Interior has been recorded saying “I don’t know any police officer nor gendarme who has attacked Yellow vests”, showing, once again, to the French population either his taste for lies or his filthy ignorance of the reality on the ground; both of which are a major flaw for a Minister of the Interior. At the same time, Macron launched what he himself calls “Le Grand débat” [the Great Debate], a debate that consists of touring France and discussing with the mayors, which leads his opponents to say that he is campaigning, at the expense of the state, for the next European elections, elections that polls show to be favorable to those whom the mainstream press calls “the populists”, i.e. those against whom Macron is fighting. While the first debates, broadcasted entirely on television, had attracted a lot of curious spectators, their audience has rapidly decreased. Nothing has emerged from this Great Debate so far and a large majority of the French (60%) believe that it is a simple smoking screen from which nothing will come out. As for the Prime Minister, he just submitted to the parliament an “anti-hooligans law” which, in his opinion, is “not at all a law due to the actual conditions” but a law to allow demonstrators to demonstrate in complete safety; as if it was the hooligans and not the CRS who were threatening the safety of the demonstrators. This law will allow any police officer to register any person “suspected of being a hooligan” in a protest ban file, the suspicion being sufficient. The same kind of file already used against football hooligans but not on mere suspicion this one. On the other hand, we are witnessing the emergence of small citizen initiatives around the movement. Assembly of Yellow Vests ; promotion campaign of the RIC by Etienne Chouard ; a young lawyer, Francois Boulo, a very good speaker, is becoming an effective spokesman of the movement ; the launch of a special Yellow Vests app named GJ-France…. As an example of the numbers of protestors turning out each Saturday is the below from last Saturday. This is being repeated across France. Macron is trying to wait them out. They might have to up their game to get any more concessions. We must admire the French for their tenacity; they're not like us . . . take to the streets for an hour or two then go home and watch our favourite soaps or some footie. My guess is that sooner or later the weight of their continued weekly actions will grow to have an accrued impact on Macron. Last I heard his popularity rating was down to single figures (9%). The French, especially in rural areas, want him gone. He only (up to a point) has support in Paris as far as I can tell - and not a lot of that... except from the bankers and neoliberal ruling elite. Morons destroying property which tax payers will wind up paying to replace, one way or another, either through higher taxes or insurance rates. I think Macron is dead meat. You know it's bad when the French of all people find their balls and come out in numbers like this. "Spain is the latest EU country to see mass protests against their Government. As usual, our state sponsored propaganda machine is playing it down." From a source in France I've learned that the antifa are used as cover bu police in soros pay to infiltrate the image based gathering become agitators and escalate violence in French protests. 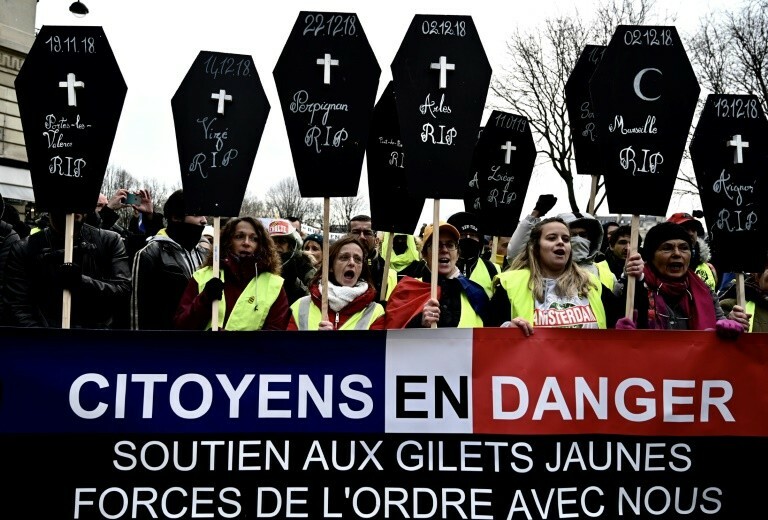 The original Gilets Jaunes were peaceful and lawfully seeking governments compliance with the French constitution requiring a "Citizens Initiative Referendum", the French call it "RIC". The government has no complied. Instead they have used the apparent confusion and division of the infiltrations to pretend that the public is confused and instead made a request for the public to submit written suggestions and initiative. This is exactly the same tactic as congress has used to avoid calling an Article V convention, pretending that the constitution requires "same subject issue" between states seeking amendment. Now the yellow vest is imported to America by the infiltration and global intelligence agencies seeking to derail the movement. Here is evidence of such intelligence agency plotting. "For decades, the NSA and GCHQ have worked as close partners, sharing intelligence under an arrangement known as the UKUSA agreement. They also collaborate with eavesdropping agencies in Canada, Australia and New Zealand under an arrangement known as the "Five Eyes" alliance." On FB night before last I took these screen shots of a member who is urging protestors in the streets on the 23rd. Image IMG_2906.PNG shows a screen shot of the royalpublishingsociety.org "about us" page. Further reading there shows that they society supports the .EU. Hardly an organization that a yellow vest would be a part of. and clearly use constitutional law to end the infiltration of the federal government that occurred with the act of 1871. It does this with a proposal for a California ballot initiative that will inform the nation while unifying california constituionally. Many support it, but admins only provide lip service and continue to urge protest in the streets where infiltrations can escalate violence and police surpression that will marginalize the movement with media misrepresentations. All protest is an effort to overcome the abridging the natural law PURPOSE of free speech which is to assure that information vital to survival is shared and understood. Tyrants do not want this, and never have. This group has the orientation that goes back to using laws that existed well before the united states, but ARE adopted by the united states, confirming their validity. But rather than just yellow, its is all colors and it stands for safety. The American Safety Vest. As in France, the American version is constitutional, so yellow. A Green vest is environmental concerns. Whatever, one can get the idea that the original concept is recovered. It is about safety, and the Declaration Of Independence defines aspects while the 9th Amendment empowers our adaptation.